Atlit is a large Crusader fortress, 20KM south of Haifa. It was built in the 13th Century to add a port and protect the pilgrimage road from Acre to Jerusalem. It was the last Crusader outpost in the Holy Land, evacuated in 1291. 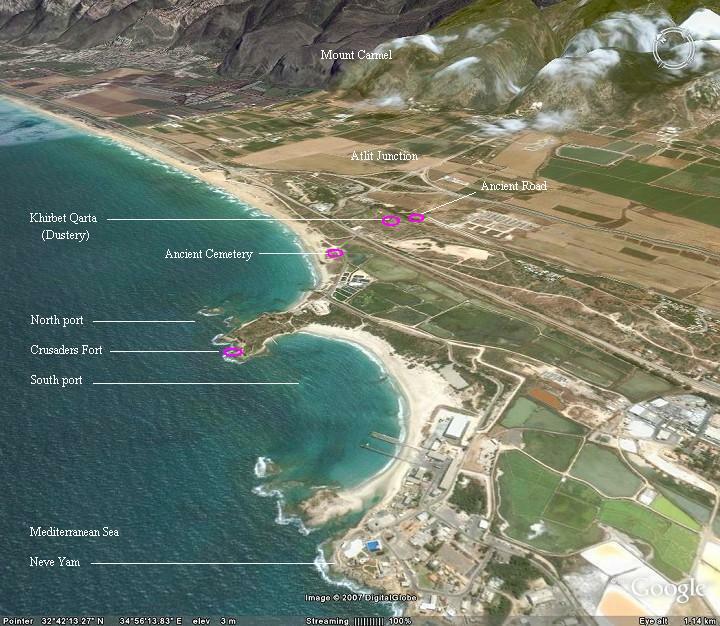 The site is located 20KM south of Haifa, on the sea shore, 3 KM west of Mount Carmel. It is a large site (400Mby 500M) that dominates the scenery of the southern shore of Haifa. Due to its ideal location on the shore of the Mediterranean Sea, and its natural large bay (the second largest after the bay of Haifa), the site has a history of thousands of years: it was inhabited during the Early Canaanite, Late Canaanite and Israelite periods. Its Canaanite name was Qarta or Certha. Later it was a Phoenician port. 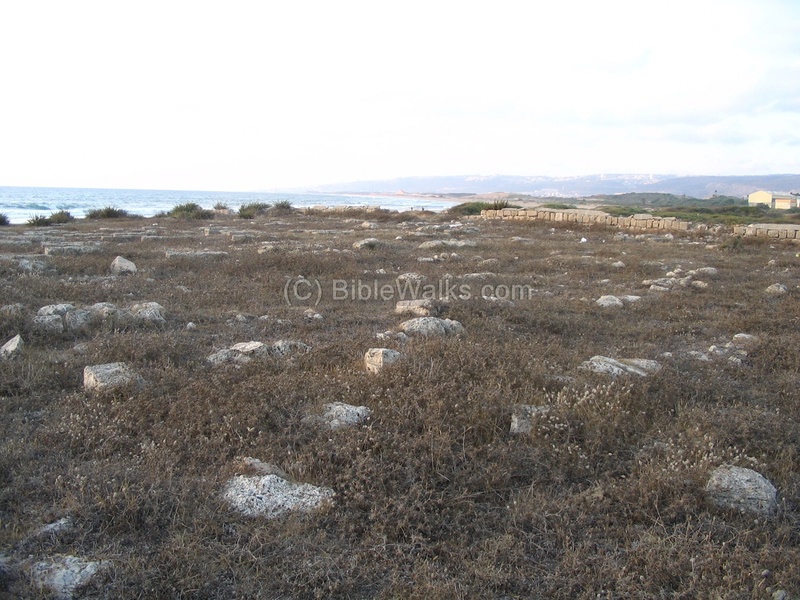 This port, at the 8th and 9th century BC, probably served the commerce with the Israelite Kingdom, as documented in the Bible (for example, Hiram King of Tyre traded with King David and Solomon). Later, it was inhabited in the Persian and Hellenistic periods, Roman and Byzantine periods. Initially, the Crusaders built a very small post (21M x 18M x 3m Height) called Dustrey (also named Qarta). Its location is about 1KM east to the larger (and later) castle, adjacent to the ancient north-south road. Its was actually quarried out into the sandstone ridge. This post was used to deter the robbers and road pirates that attacked the pilgrims, and was built after the Crusader's King Baldwin I was nearly killed at this place by robbers in 1102. The first construction phase of the great fortress started in 1218-1220 AD. The fort was enlarged later in several phases. 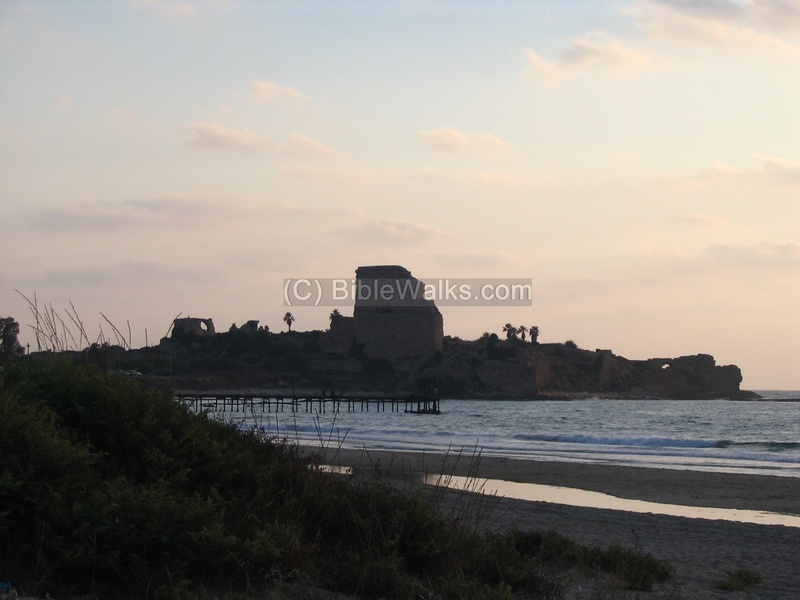 The purpose of this castle, called "Castellum Peregrinorum" (castle of the pilgrims), was to protect the pilgrims road along the coast from Acre to Jerusalem, and to add another port for the Crusaders in addition to their main center in Acre. 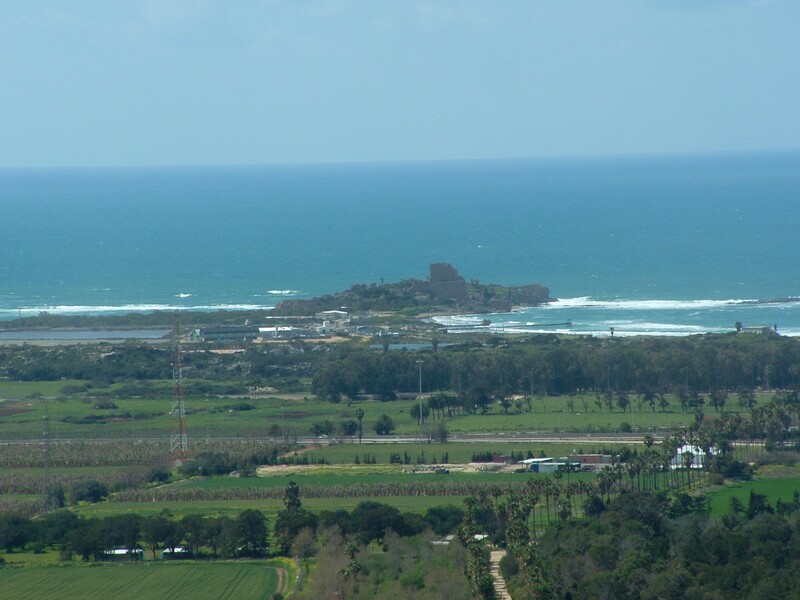 It was built in conjunction with the castle in Caesarea, for the same purpose of protecting the road and adding an outlet to the sea. Atlit was the last Crusader outpost in the Holy Land. After their retreat (August 1291 AD) and its partial destroy, the fortress was repaired and held by the Mamlukes. During the 19th century the fort was heavily damaged by an earth quake, and many of its stones were looted and reused by the Turks in other cities. In spring of 1799 the port served as one of the French navy ports during Napoleon's failed expedition to conquer Acre. Today, the site is in ruins. 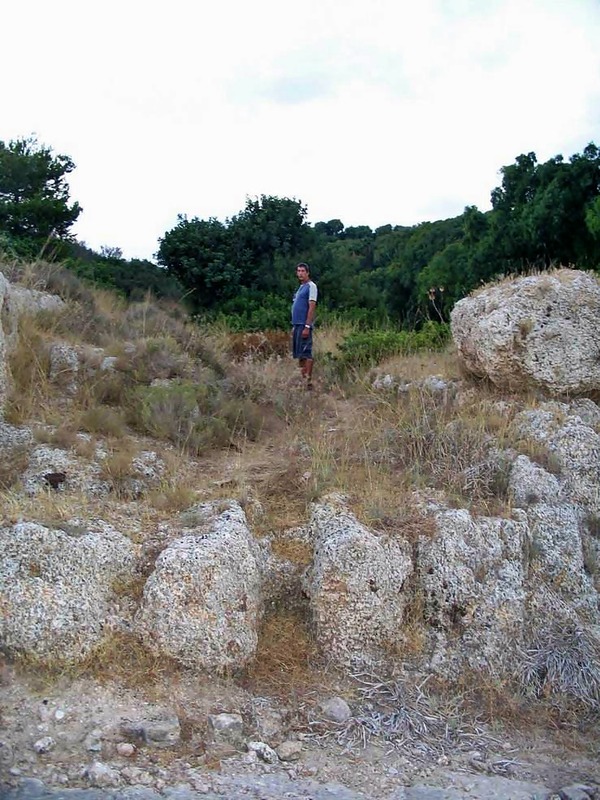 The castle site is not reachable since it is a military area. On the west side of the site there are industrial salt ponds. The British forces built army camps and ammunition dumps in the vicinity, including the Jail where they imprisoned Jewish immigrants during the British Mandate (you can visit the camp, where a museum for “Illegal Immigration”). A Modern city (Atlit) was built nearby, established in 1903 on land purchased by Rothschild. It is now expanding to the sandstone hills south east of the castle, and the whole area has seen a massive real estate push. The city is trying to get the army base moved away from the Crusaders site in order to open it to the public. An aerial photo is shown below, indicating the major points of interest. You can point on the purple points to navigate to the selected point. The old small post, Dustery, is shown in the center, along the North /South road. 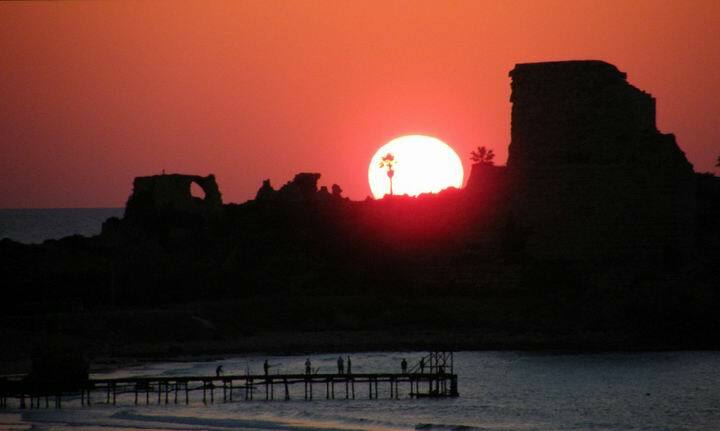 The Atlit Crusader fortress is located on the beach near the modern city by the same name. Only a few walls are seen standing in this ancient city. The castle is built on an eastern side which is separated from the mainland by a moat. The Northern port's wall can be seen at the right side - stretching into the Mediterranean Sea. 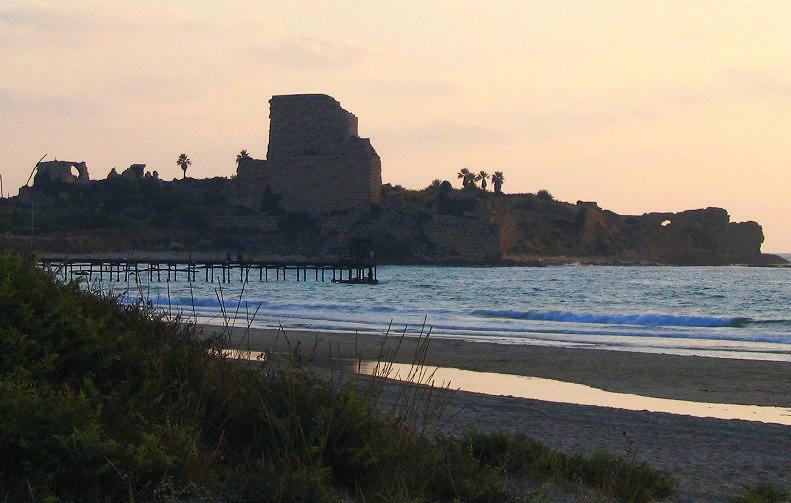 The southern port is hidden behind the castle, and used the natural bay as the base of the port. 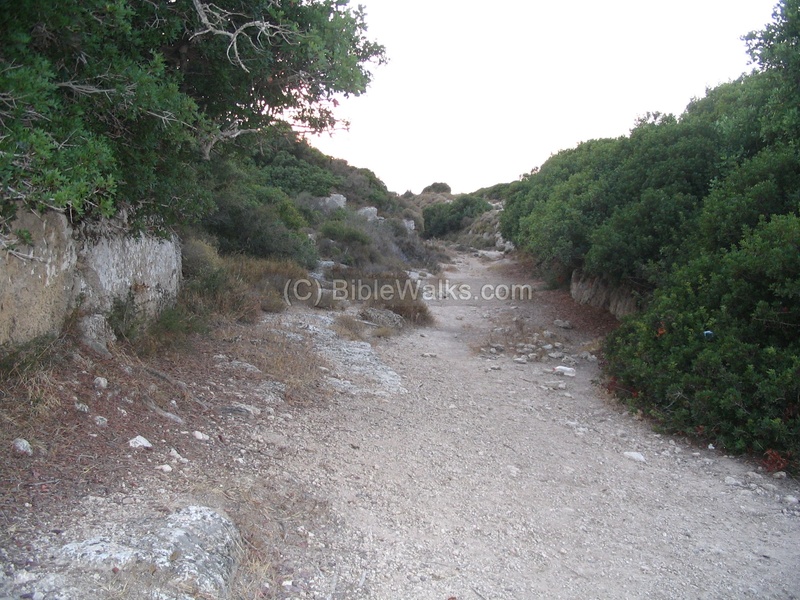 Another view from the east, taken on the edge of mount Carmel, is seen in the photo below. In the north of the fortress there is an ancient cemetery with hundreds of tombs from the Crusader period, covering an area of 80 x 100M. There are 4 illustrated tomb stones in this ancient cemetery. 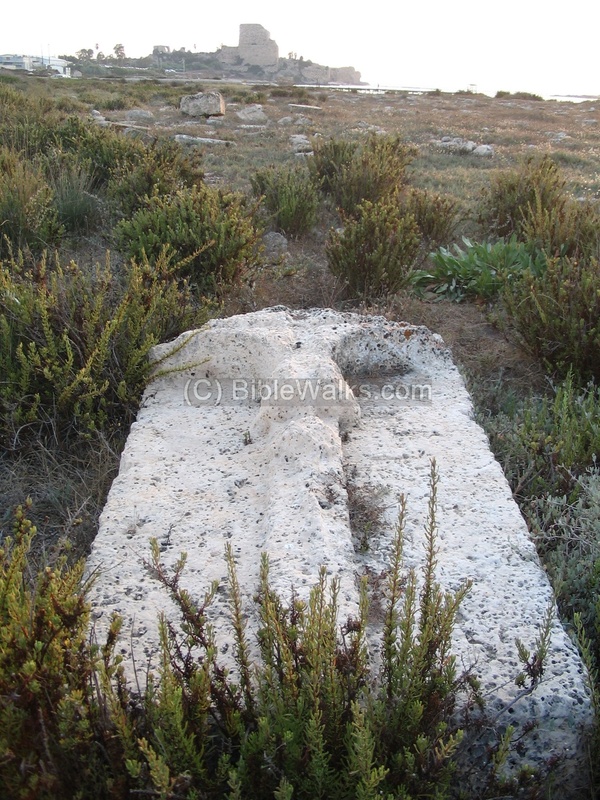 One of these Crusader tomb stones has a cross in the shape of an anchor, as seen on the right photo. The Ancient road (250M long) is carved into the eastern cliffs of the sand-stone hills (east of the castle). The signs of wheel ruts from the thousands of wagons that passed this road are visible along this pathway. The eastern side of the road has crumbled over the years. On the south side of the road is a stone quarry. 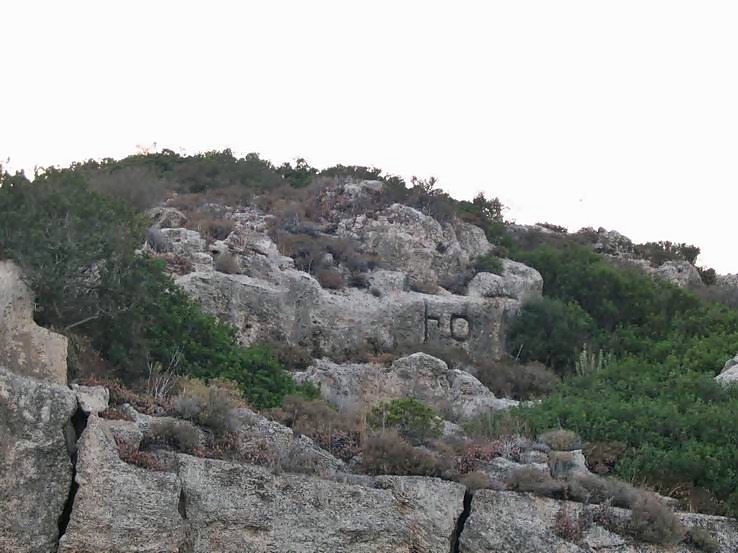 On this ancient road, two very large Phoenician letters ("Ayin" ," Taff") are carved out in the rock on the eastern cliff. This word is "AT", and it maybe the prefix of Atlit. This shows that the road has been in use, at least, from the Phoenician period (7/8Th C BC) to the Crusaders (12/13 c AD). The road passes this hillside since the land in the east of this place was marshes, since the water coming from Mount Carmel could not pass these hills naturally. Only in the Roman times some narrow passes were dug out through the rock in order to dry out these wetlands, such as a passage nearby (Wadi Dustery). The following photo shows the entrance to the Castle from the main ancient road, which goes east to west. It is cut deep into the sandstone hill. There are places to tie the horses, and water basins for the horses. The Dustrey (Qarta) fort is on the right side, behind the trees. A long sandstone ridge stretches in parallel to the coast line. The Crusaders used it as their first line of defense, building posts such as Qarta (Dustrey), horse stables, gates and roads. This aerial view shows one of the horse stables along this ridge, used by the defending knights as a front line post. It is located near the old synagogue in the nearby modern city Atlit. Sadly, a new neighborhood was recently approved to be built along this unique sandstone ridge. In spite of numerous protests, the building plans will affect the historic ridge. Emergency excavations are now (2015) conducted in several locations. The next aerial photo shows one of the Crusaders period stone quarries, as the builders of the fortress required a large number of building blocks. A beautiful sunset photo is seen below. Atlit was the last Crusader outpost in the Holy Land, and can be called the "sunset" castle. The fortress is not reachable since it is a military area. You can, however, get close to the site by driving from Haifa down the main highway Tel-Aviv-Haifa about 20KM, turn right in the Atlit junction, and continue straight on for 2 Kilometers. To get to the Qarta/Dustrey fort and Phoenician letters, stop at the park which is southwest of the junction. The site was excavated during 1932-1938 by the British Archaeolog Johns. Ariel Encyclopedia - Qarta, Certha; Athlit. Atlit/Athlit - The name of the city in Arabic. One explanation for the source of the name is - according to J.S. Bukingham, a 19th C Holy Land traveler - is from Greek: "Atlethes", meaning strength, since the place was a stronghold. Castrum Peregrino - the Crusaders name of Atlit, "castle of the pilgrims" since it protected the pilgrimage road from Acre to Jerusalem. Qarta or Certha - the Canaanite name of Atlit. The source of the name may have come from City (Carta/Qarta/Qeret in Hebrew). Majdal Malcha - the Arabic name - Majdal (tower) of salt (Malcha), due to the salt industry in the area which exists here for thousands of years until modern times.